There has never been a more popular time for dinosaurs and all things dinosaurian. From blockbuster films packed with breathtaking CGI effects, children's television and video cartoons, computer games, CD-ROMs, animatronic museum exhibitions, and theme parks, to countless books, magazines, toys large and small, ornaments, collectabilia, and even fun lines in confectionery and other edibles, prehistoric paraphernalia continues to scale new heights of desirability worldwide. But nowhere is this more apparent than within the philatelic world - where the issuing in recent years by an ever-increasing number of countries around the globe of handsome, highly-prized stamp sets depicting a spectacular array of dinosaurs and other prehistoric animals is matched only by the corresponding increase of thematic collectors eager to amass an eyecatching, comprehensive menagerie of palaeontological monsters that the custodians of Jurassic Park could only dream about!Today, well over 500 sets of stamps portraying all manner of dinosaurs and also a multifarious assemblage of other prehistoric animals have been issued, with a substantial proportion of these having appeared within the last decade alone - confirming the escalating interest among collectors in this exciting thematic subject. And who can blame them? After all, where else but in the pages of a stamp album could stegosaurs and plesiosaurs, tyrannosaurs and sabre-tooth tigers, brachiosaurs, mammoths, belemnites, ground sloths, giant birds, and ichthyosaurs jostle for attention with velociraptors and trilobites, dimetrodonts and diplodocuses, mosasaurs, woolly rhinoceroses, Archaeopteryx, titanosaurs, iguanodontids, ammonites, giant sea scorpions, and innumerable other spectacular denizens of our planet's distant past? Now, for the very first time, here is a philatelic catalogue devoted exclusively to these incredible animals. 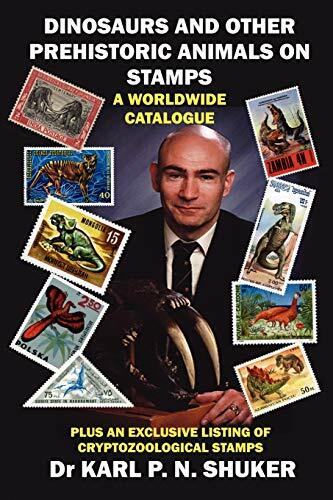 Compiled by zoologist Dr Karl P.N.Shuker, a lifelong, enthusiastic collector of wildlife stamps and with an especial interest in those that portray fossil species, it provides an exhaustive, definitive listing of stamps and miniature sheets depicting dinosaurs and other prehistoric animals issued by countries throughout the world. It also includes sections dealing with cryptozoological stamps, dinosaur stamp superlatives, and unofficial prehistoric animal stamps. This invaluable book will undoubtedly encourage everyone with a passion for dinosaurs and other prehistoric creatures to pursue it not only on screen, in books, or in museums but also via the ever-fascinating world of philately.